This summer has certainly been packed full of inflatable fun across Newcastle with the launch of our indoor giant inflatables at Better leisure centres in Walker and the city centre. Inflatable Planet at Better, Walker Activity Dome, which is managed by an external company, has reached the end of its summer roadshow at the centre and will be moving on after the October holidays. The giant inflatable at Better, Eldon Leisure Centre has been running sessions around existing activity bookings in the sports hall since August. This has not been the best solution for continuity and communicating when spaces are available, which has had a knock-on effect to the bookings we have taken so far and to other sports hall bookings. We have been reviewing the different bookings and demand for sports hall space at both Walker Activity Dome and Eldon Leisure Centre, so that we can decide on the best solution moving forwards. We received feedback from sports hall users who felt that the inflatable sessions were restricting the times available for them to make activity bookings at Eldon Leisure Centre and some bookings had to move completely from Walker Activity Dome to accommodate Inflatable Planet. Plus, we are removing the requirement for grip socks so £2 is all you pay! 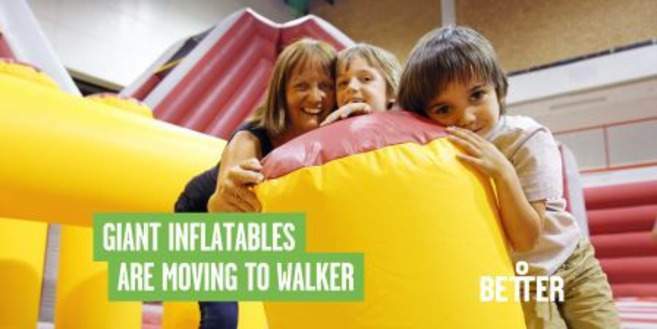 Bookings for giant inflatables will be available at Better, Walker Activity Dome from Saturday 24th November. Hopefully this decision will mean that everyone can make the most of our sports hall spaces and Better, Eldon Leisure Centre customers can still enjoy a great choice of family facilities including soft play, tenpin bowling and Vertigo climbing.